Investigators at UCLA developed a cardiovascular magnetic resonance imaging (MRI) technique named 4D MUSIC for pediatric congenital heart disease patients. Compared to the current clinical standard MRI techniques, the MUSIC technique achieves greatly improved definition of cardiovascular anatomy and function and provides high-resolution dynamic coverage of the entire chest using novel MRI pulse sequences and contrast generation mechanisms. 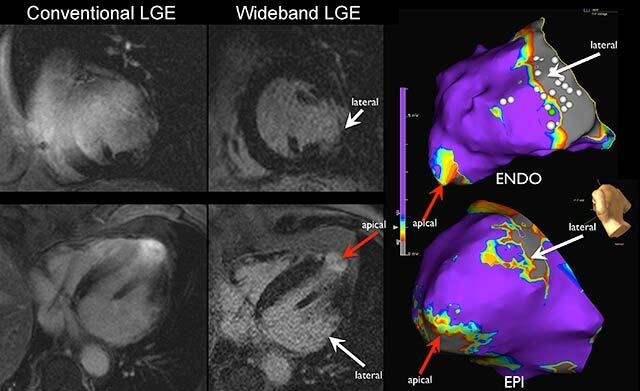 The 4D MUSIC technique presents a paradigm shift in cardiovascular MRI for pediatric congenital heart disease and will likely help reduce exposure of these young children to invasive diagnostic catheterization and its associated ionizing radiation.Reference: Han F, Rapacchi S, Khan S, Ayad I, Salusky I, Gabriel S, Plotnik A, Finn JP, Hu P. “Four-Dimensional, Multiphase, Steady-State Imaging with Contrast Enhancement (MUSIC) in the Heart: a Feasibility Study in Children”, Magn Reson Med, 2014, Oct 9. doi: 10.1002/mrm.25491. Rapacchi S, Natsuaki Y, Plotnik A, Gabriel S, Laub G, Finn JP, Hu P. "Reducing view-sharing using compressed sensing in time-resolved contrast-enhanced magnetic resonance angiography", Magn Reson Med, 2014 (In Press).